Today in France, agriculture does not account for more than 3% of the total employment and 3% of the total GDP. We are in the “World Without Agriculture” (Timmer 2009). In this world are also other OECD countries. If you follow their path of industrialisation and reach this “World Without Agriculture”, you get almost no farmer but those who remain harvest big pieces of land with powerful tractors, combine harvesters and sometimes airplanes. The farm labour productivity in OECD nations has increased thanks to such machines or robots using fossil energy. We have developed agriculture by expelling farmers from the land. Can India, with Punjab in the lead, also follow this so-called “modern economic growth”? My answer is clearly no, or at extremely higher economic, human and environmental costs than for OECD countries. According to FAO scenario, the land availability per farmer may grow up to 200 ha on an average in North America in 2050, while the same figure would be less than 0.8 ha in both Asia and Sub-Saharan Africa (Dorin 2017). Today, the figure for India is less than 0.7 ha. And what do we see for Punjab – one of the leading states in India for agricultural production? All in all, in 2011, compared to 1970, the income gap with other workers has not increased (unlike in most other Indian states) nor decreased, but the state’s active population in agriculture has increased (as in most developing countries). Hence the average available land per farmer has shrunk in 40 years. What is the way to increase farm labour productivity when your land is shrinking from a generation to another instead of increasing? The only option is to increase your yield per unit of land if your unit selling prices must not increase to ensure food access to the poorest. So, you go for mono-cropping, with ever more use of genetic engineering, groundwater, chemical fertilizers and other agrochemical inputs, as recommended by public and private agencies over the past fifty years. The result is a decline in marginal productivity, increase in costs, and dramatic erosion of natural capital in the form of soil, biodiversity, safe water, etc. • Secondly, you have to compete a lot to find a job in nonfarm sectors since due to automation, these industries are much less labour-intensive than they used to be in the past. I believe that a sustainable path lies in a high-tech agriculture of a very different nature from that which has been strongly encouraged and subsidised over the last half-century, in India, in France and everywhere else in the world. Because India today faces all the economic, social, nutritional, financial and ecological burdens of conventional intensive agriculture, and because it is also the biggest world democracy with dynamic farmers and a large scientific community, I am convinced that this country could lead a much more sustainable and inclusive agricultural model. The technical and institutional challenges are vast and complex. However, we are not starting from nothing. In recent years, there has been more and more international debates and literature about “agroecology”, and here are the seeds for a paradigm shift in our thinking of agriculture, especially smallholder agriculture that will continue to remain dominant in the world. Agroecology embraces many definitions. In my opinion, agroecology does not completely ban the use of industrial inputs like in organic farming or permaculture. 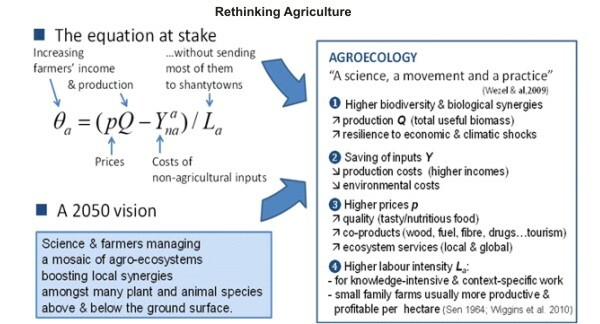 But in agroecology, increase in agricultural productivity does not rest on few large-scale monocultures and an intensive use of water, fossil fuels and agrochemical inputs, but rather on context-specific agro-ecosystems boosting biological synergies below and above ground, amongst numerous plant and animal species, from soil fungi to trees, from soil bacteria or worms to buffalos, etc. (d) more profitable for farmers if commodities of higher quality (diversified tasty nutritious food) and ecosystem services of local and global importance are equitably priced on local and international markets, such as safe water, biodiversity pools, soil fertility, nutrient recycling, pollination, disease and flood control, climate mitigation and adaptation, etc. All this leads me to share guidelines for a paradigm shift to convert the burden of small-scale farming into a comparative advantage. Keep also in mind that the bulk of the scientific literature shows that agriculture – unlike other sectors – is more efficient at small rather than large scales. 2) Register accurate numerical benchmarks of how disastrous is current Punjab agriculture, especially on environmental and income aspects. 3) Assess and bargain future payments for environmental services from local municipalities, the National Capital Region, the Central government as well as international organisations. Join for instance the 4p1000 initiative (www.4p1000.org) and become its leader in order to claim that any sink of carbon by agricultural soils must be a major part of the carbon trade system. 4) Start advertising in your state, in the country and also abroad (as does Chandrababu Naidu for Andhra Pradesh) that Punjab agriculture is moving firmly towards agroecology, and may be 100% organic by 2025. You could even claim an ambition to become a world net exporter of various plant and animal organic products whose demand is growing sharply everywhere. Affirm this ambition by passing a state law for changing production models to combine economic and environmental performances, as did the French in 2014 with their “loi d’avenir” in favour of agroecology. 5) Radically change the rationality of Indian incentives to agriculture. Instead of incentivising directly or indirectly the mono-cropping of wheat and rice, as well as the use of groundwater, chemical fertilizers and fossil fuels; distribute these huge subsidies by rewarding the saving of water or fossil energy by tonne of biomass, the storage of soil organic carbon, the crop and livestock diversity, etc. Deliver also cheap credit and insurances, especially to encourage entrepreneurship in small-processing units, new marketing strategies, safe storage and transport. Dorin B., 2017. "India and Africa in the Global Agricultural System (1960-2050): Towards a New Sociotechnical Regime? ", Economic & Political Weekly, LII:25-26, June 24, pp. 5-13. Dorin B., Hourcade J.-C., Benoit-Cattin M., 2013. A World without Farmers? The Lewis Path Revisited, Working Paper, CIRED, Nogent sur Marne, 26 p.
Timmer C.P., 2009. A World without Agriculture. The Structural Transformation in Historical Perspective, The American Enterprise Institute, Washington D.C., 96 p.